Music can have a powerful effect on the mind and body. Think about how a song can lift your spirits or make you want to get up and dance. Music therapy is an evidence-based practice that harnesses the power of music to improve quality of life in people dealing with illness. Whether someone is having physical symptoms such as pain, nausea, or shortness of breath, or emotional struggles such as depression, anxiety, isolation, loneliness, anger, or fear, music therapy can help. Music therapists are credentialed professionals who have received a bachelor's degree or higher in music therapy and who maintain a national board-certification. It can ease pain and other symptoms. Studies have shown that music therapy can help reduce pain perception. In a study of patients who underwent surgery for lung cancer, the patients who received music therapy before and after surgery reported less pain and had lower blood pressure, heart rate and anxiety. In addition, the dose and frequency of pain medication given after the surgery was reduced in the group who received music therapy. It helps you express emotions. Music therapists often help patient write songs about their experiences with cancer treatment. Songwriting can help people process thoughts and emotions that can be hard to express through talking. You can write about feelings such as sadness, anger, disappointment, fear, and confusion in a song. It connects you with people. Music therapists bring a variety of instruments with them when they see patients in the hospital. Guitar, drums, shakers, ukulele, harmonica, flute, and keyboard are just some of the instruments that a music therapist might use with a patient. When patients and caregivers play instruments together, they get to interact in a new, different, fun way. This can help you share feelings and feel connected with other people. Listening to your favorite music makes you happier. Music therapists know lots of different songs, artists, and styles of music. When patients listen to their preferred music, they often report higher feelings of relaxation, calm, safety, and comfort. It lets you focus on something other than cancer. Going through cancer treatment can be stressful and exhausting for patients and caregivers. Things can change day to day. Music therapists meet patients in the moment and help them manage whatever symptoms they are dealing with at that time. Each music therapy session can look different. Music therapists are trained to treat the whole person, taking into account the physical, mental, and emotional needs of each patient. 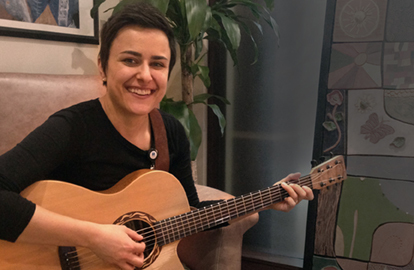 Huntsman Cancer Institute (HCI) has two music therapists on staff who see inpatients, outpatients, and caregivers. 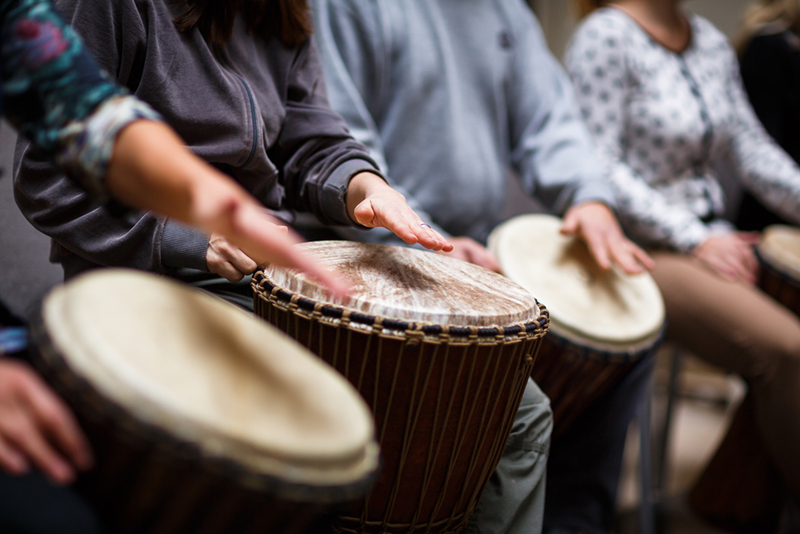 Visit the HCI Linda B. and Robert B. Wiggins Wellness and Integrative Health Center website or call 801-587-4585 to learn more about music therapy and to schedule an appointment.